Available in 3oz/85g, 5.5oz/156g, 13oz/387g cans. Chicken, Chicken Broth, Chicken Liver, Lamb, Dried Egg Product, Ground Flaxseed, Potassium Chloride, Apple Powder, Cranberry Powder, Pumpkin Powder, Salmon Oil (preserved with Mixed Tocopherols), Taurine, Chicory Root Extract, Choline Chloride, Cassia Gum, Xanthan Gum, Salt, Iron Proteinate, Zinc Proteinate, Blueberry Powder, Papaya Powder, Pomegranate Powder, Vitamin E Supplement, Peppermint Leaf Powder, Cinnamon, Fennel Powder, Thiamine Mononitrate, Copper Proteinate, Manganese Proteinate, Sodium Selenite, Niacin, d-Calcium Pantothenate, Pyridoxine Hydrochloride, Riboflavin Supplement, Vitamin A Supplement, Biotin, Potassium Iodide, Vitamin D3 Supplement, Vitamin B12 Supplement, Folic Acid, Rosemary Extract. 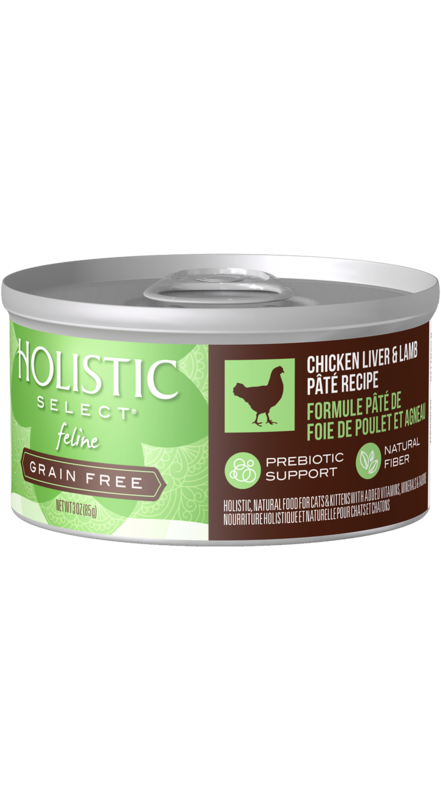 Holistic Select Chicken Liver & Lamb Pâté Recipe Cat Food is formulated to meet the nutritional levels established by the AAFCO Cat Food Nutrient Profiles for all life stages. 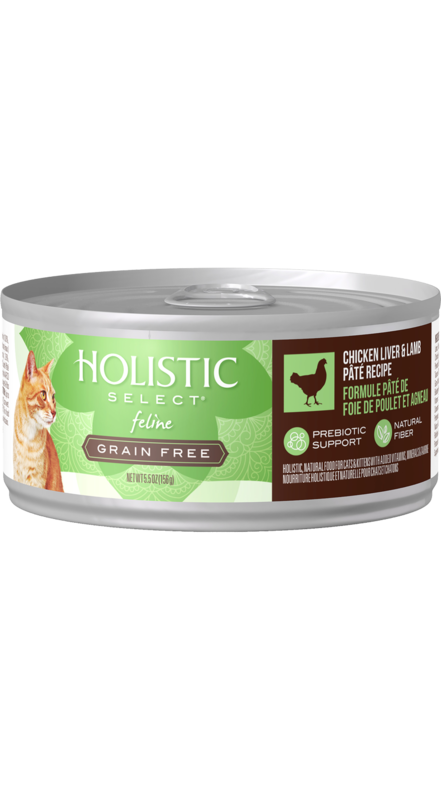 Adult: Feed ½ can per 6-8 lbs of body weight per day. Kitten: Feed up to twice the adult amount. 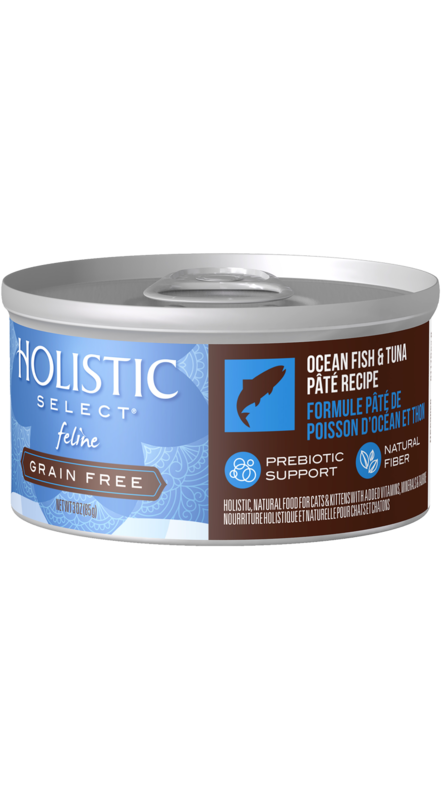 Gestation and Lactation: Feed up to three times the adult amount. Combination Feeding: Reduce dry by ⅛ cup for every ¼ can wet. CALORIE CONTENT (calculated): This food contains 1,349 kcal/kg or 496 kcal/can ME (metabolizable energy) on an as fed basis.